The real estate boom has gone global, and those successful investors who want to keep up their profits are starting to look at emerging markets on other continents. Markets in South America, Eastern Europe, India, and Asia are currently experiencing the rapid growth that mature domestic markets experienced a few years ago. 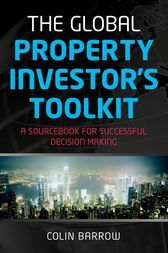 Based on the author's personal experience buying and selling dozens of overseas properties, this book provides all the relevant data investors need to evaluate properties and markets anywhere in the world. Colin Barrow (Hayle, Cornwall, UK) is a non-executive director of two venture capital funds and serves on the UK Government Task Force for Business. Colin Barrow has bought and sold over 50 overseas properties. He's a venture capitalist, government policy advisor and prolific business and property writer. his previous books include Buying a Property in Eastern Europe For Dummies and Starting a Business for Dummies, and many more. Over the past decade he has been researching property investment strategies in emerging markets and has written books on property covering Eastern Europe, turkey, Spain and Portugal.